On May 27, 2008, Chinese Vice Foreign Minister Li Jinzhang met with Ambassador of the Commonwealth of Dominica to China David King Hsiu and accepted a donation of 100, 000 U.S. dollars made by David King Hsiu in his own name to the Wenchuan earthquake area. What does the names Lakschin, King, Torner, and Hsiu have in common? They are all famous Dominicans that the majority of the population knows nothing or very little about. Lakshin is Russian, King is Bahamian, Torner is French and Hsiu is Chinese. They have all become Dominicans by way of its economic citizenship program, and at one time or the other held the distinguished position of Dominican ambassador. Roman Laskschin was recommended to be Dominica’s ambassador to the United Nations and the World Trade Organization; Rudolph King was named Dominica’s ambassador to Bahrain, Eric Torner is Dominica’s ambassador to UNESCO, and David Hsiu represents the country’s interest in China. Every self respecting country unable to commit large sums of money to maintain ambassadors overseas usually relies on appointing honorary counsels. These are usually people of high repute, distinguished residents of that country willing to give of their time and energy to help build lasting diplomatic relations between their country and the one they wish to represent. A disturbing trend however, has emerged with regards to Dominica. The country appears to have adopted an approach that is contrary to the norms of international best practice, and that is shrouded in secrecy. In exchange for large sums of money under an ill advised citizenship program, people of less than stellar repute are buying the sacred ambassadorships. Interestingly, the Treasury cannot account for these monies and other hundreds of passports that have ostensibly been sold under the program. In the process, these ‘ambassadors’ have sullied the country’s good name and heaped shame and scorn on its populace. Take the case of Lakschin. Russia rejected his credentials twice, once under the James government and later under Skerrit’s government. In April,2006 after the Swiss government twice revoked his credentials to serve as Dominica’s ambassador to the United Nations in Geneva, Dominica filed suit in the International Court of Justice against the Swiss. The charge, alleged violation of the Vienna Convention on Diplomatic Relations. The news sent shockwaves across international diplomatic circles. A few weeks later it quietly withdrew the case. (See related) More on Lakschin. Remarkably, Dominica was willing to bring suit against Switzerland for rejecting Lakschin as ambassador because the Swiss considered him to be a ‘businessman’ and not suitable for the role. Yet, legal action was pursued. How could this be? What sway did Lakschin have over the Dominica government that even when it was clear that there were problems with his appointment, the government was wiling to use taxpayers money to hire a top British attorney to defend it’s case before the international court. As it turns out, Lakschin had been sued in the Swiss courts for close to a quarter million dollars, one of several cases brought against him. In an attempt to escape justice, he evoked diplomatic immunity claiming that he was still Dominica’s Ambassador. The Swiss government stood firm by their earlier decision that as a businessman, he could not be an ambassador. And so, Dominica sued. However a few days after the case was brought and as it began to gain international notoriety, it was quietly withdrawn. Dominica’s goodwill ambassador, Bahamian Rudolph King is languishing in a United States jail after being brought up on charges in a US federal court for trying to defraud the government of more than $2 million, all while brandishing his Dominican diplomatic passport. Related story. Rudolph King presents his credentials to Prime Minister Shaikh Khalifa Bin Salman Al Khalifa of Bahrain on August 29, 2006. The fact is long before King ended up on the internet presenting his credentials as Dominica’s ambassador to the Sultan of Bahrain his shady dealings were littered over the internet. A quick Google search would have revealed that. Apparently no due diligence was done. Remarkably, when King was appointed ambassador he had just been declared bankrupt in the Bahamas. Since no public records are available on the sale of the diplomatic passports, it is not known if King was able to pay the $100 000 to secure that previledge or whether he simply promised to pay. Felix Chen, a Chinese businessman with a fondness for Dominica recently filed suit against David Hsiu, Dominica’ ambassador to China, at the Eastern Caribbean Court of Appeal in the British Virgin Islands. According to the complaint, Hsiu had failed to deliver on his promise to make available to Chen a share in the Layou River project for which he had paid $20 million. As the case came to light, Hsiu retaliated by filing a counter suit in which he named Dominica’s Prime Minister as a co-defendant. The Prime Minister was then forced to issue an affidavit to support the Government’s claim and Felix Chen's assertion in his rectification case that the Government owns 51% of the Layou River project. While it is difficult to point to any diplomatic breakthroughs made by Hsiu, his picture is plastered over the internet where he is seen cozying up to high ranking Chinese officials making cash donations. These gifts could ostensibly be from the sale of Dominican passports to which he was entrusted. One of his donations of $100 000 was presented to the Chinese government for earthquake relief on behalf of the people of Dominica. Quite intriguing is the fact that the amount is exactly the cost of one passport. While we cannot say for sure that it is money from the passport sale, there are no previous accounts of ambassador Hsiu's largesse to the Chinese before he became ambassador. Unconfirmed reports from Dominica indicate that Hsiu and his agents were given an undisclosed number of passports to sell as they saw fit. However, the Skerrit government has consistently denied that any such passports were given to Hsiu. Which brings us to another vexing question. Why are agents acting on behalf of government allowed physical possession of Dominican passports. It seems to me that these agents should be charged with making the initial contacts and once they’ve lined up the clients they should then be referred to Dominica. Why are those sales not centralized and the finances handled by the Dominican treasury? My own investigations show that upwards of $25 million has been gleaned from the sale of Dominican passports, yet little if any of this has found its way to the Treasury. Equally baffling is the fact that the agents acting on government’s behalf has no limit on how much they can sell the passports. In fact, it is believed that Grace Tongue, a Taiwanese national instrumental in starting the Layou River Hotel made millions in the sale of Dominican passports, which have yet to be adequately accounted for. The Swiss government in rejecting the credentials of Lakschin gave as their primary reason the fact that he was a businessman and not a diplomat. The same can be said of King and Hsiu. I am still trying to determine what exactly is the nature of Hsiu’s business dealings. I know that he inherited the Layou River Hotel project – already financed by millions of dollars from the sale of passports to anxious Chinese who were trying to get out of Hong Kong around the time of it reverting to Chinese rule in 1999. The obvious question is whether the businessmen turned ambassadors were taking advantage of a naïve, poor country by seeking the cloak of diplomatic immunity for their less than transparent business dealings. Alternatively, one can pose the question as to whether the Dominica government has made a serious error in judgment in opening up the country’s good name to international shame and ridicule. While we do not mean to suggest the following ambassadors can be put in the same category as those described above, it is important to look at a few more that I discovered during the course of the investigation. In the run up to the 2005 general elections, Susan Oldie gave $400 000 to Citizens for a Better Dominica”, an organization headed by Mayor of Roseau Cecil Joseph, a ranking member of the ruling Dominica Labour Party (DLP). It was later reported that Oldie, a Cayman Island resident had given the money in exchange for a diplomatic passport. However, the money was used to finance the election campaign of the DLP. In March of 2006, US gospel music icon Dr. Bobby Jones who is often referred to as the “goodwill ambassador of gospel music” was appointed by Prime Minister Skerrit to the post of ambassador at large of Dominica for a three year term. Jones was said to have been recommended for the job after meeting with several of Dominica’s cabinet members and discussing the need for increased tourism and economic growth in Dominica. However, with the three years about to expire there is no record of Jones having made any meaningful contribution to Dominica’s economy. His Excellency Eric Torner is Dominica’s Ambassador Extraordinary and Plenipotentiary, Permanent Delegate to UNESCO. Information about the French national was particularly difficult to come by. I know however that he was appointed by the Skerrit government and is based in Paris. In 2007, he visited Dominica on a chartered yacht from the neighboring French islands, and held an elaborate party attended by government officials while the yacth was docked in the Roseau port. Other than this party I have not been able to find out any actions of note that has been taken or made on Dominica’s behalf. During the course of the investigation, I also discovered that the Skerrit government presented the credentials of a Czech Republic national to be Dominica’s ambassador to Slovenia. It is believed that the Slovenia government rejected the credentials given the history of the two countries. Unconfirmed reports also point to other holders of diplomatic pasports such as the embattled head of CLICO (an insurance company) in Barbados. We now know of these less than stellar advocates of Dominica’s interests. What is more worrisome is how many other Dominican ambassadors who have purchased diplomatic passports who are out there just waiting to embarrass our beautiful country and put us all to shame. Some might say that King, and Lakschin are no longer ambassadors, but the question remains as to why were these persons appointed in the first place. Indeed the repercussions of these reckless acts will be felt for years to come, and one gets the feeling that more is yet to be revealed. So while countless Dominicans wait in vain to lend a hand to their country, including former distinguished ambassadors like Ambassador Angela Benjamin, Food and Agriculture Organization (FAO) ambassador, government has opted to make ambassadors of those who can afford to pay for the cloak of diplomatic immunity. That is serious stuff. DA in real trouble!!! How can one professing love for and concern for the country be so unkind to its reputation? Anonymous,why don't you point out the falsehoods. On the one hand you say it is false and on the other you say it is already in the public domain. Indeed, I have heard of most of this before. It is neither new nor false, but rather an indictment on the people who run Dominica's foreign policy as though it were a private farm. What is the purpose of this article? Thompson I am disappointed that you could have some low life people hijack your website for their own political agenda. I do not know who the author of your current article"Dominica's Ambassadors of Shame"
but let me enlighten you somewhat on the subject of mr. Eric Torner, our ambassador to UNESCO. Gilbert Torner, a Swiss national is our honorary consul in Switzerland, based in Zurich - just key up: www.dominicaconsulate.ch and you will see the relevant details. Gilbert Torner, a banker by training, was a director of the "American Energy Group Ltd." from Nov.1998 till May 2000 and, as far as I know, is a shareholder in "Advance Nanotech Inc." (AVNA). He is also Chairman and C.E.O. of "Strategic Wealth Management Ltd.", incorporated in Dominica on 22 Feb. 2006 and operating from 25 Independence Street, Roseau - look up:www.swm.dm for details (or you could ask Roy E. Shillingford, who is the other member of the board). All this info. is in the public domain and I hope it helps to "fill out" the picture and keep it straight, for Dominica's sake!. In 2003 the Government of Dominica appointed Mr Peter Capela, a German National as its Permanent Representative to the United Nations Educational, Scientific and Cultural Organization, in Paris, France. Mr Capela was being assisted by Mr Eric Torner as Minister Counsel. From the date of his appointment up to this present time the office of Mr Eric Torner, in Paris, France. In 2005, Mr Eric Torner replaced Mr Peter Capela as Dominica’s Permanent Representative at the UNESCO. Over the years Mr Torner has used his own resources to ensure Dominica’s representation at the UNESCO. ii. In 2006 Ambassador Torner facilitated the visit of a group of business persons to explore opportunities for investment in Dominica. iv. In 2007 he secured 5 scholarships for Dominica Teachers of the French language to pursue teachers training at Bessoson, France with the support of the La Francophonie. v. In 2007 he represented the Government of the Commonwealth of Dominica in Warsaw Poland to negotiate a cooperation agreement with the Government of Poland. vi. In 2008 he represented the Government of the Commonwealth of Dominica at the General Assembly of the BIE (Bureau International de Exposition), in Paris, France at his own cost. vii. On February 27, 2009, he signed a Communique to establish diplomatic relations between Dominica and the Principality of Monaco. viii. Negotiated a cooperation agreement with Agence France de Development for technical assistance for the development of the Woodbridge Bay Sea Port. ix. Over the years he has been able to assist a number of Dominicans in Paris. You should seek the truth about Mr Lakschin. He was appointed sometimes in the early 1990s under the DFP Administration. Later on sometime in the mid to late 1990s he was further appointed to at a higher diplomatic level by the UWP Administration. In 2000 the late Roosie Douglas sought to reappoint him after he had found himself in some difficulties with the Swiss Authorities. I will admit that there were efforts to have the revocation of his diplomatic appointment by the Swiss Government to be reinstated since he was not accredited to Switzerland but instead to the WTO which is an organization of the United Nations Head Quatered in Geneva. The matter was not about Mr Lakschin but what was an apparent violation of international rules of diplomacy. Not once was any taxpayers money was ever involved in the submission of the case to the international court. The cost was fully covered by some international interest which felt that it was a case worth pursuing in order to further clarify international law on the subject matter. The case later withdrawn by the Cabinet of the Commonwealth of Dominica under the direction of Prime Minister Skeritt. The Government of Dominica would not be able to afford the cost of diplomatic representation in most of the major capitals in the world and at international organizations especially organs of the United Nations. From time to time there are persons throughout the world who are prepared to meet the cost of providing an office and other services on the behalf of countries in return for the privilege of a diplomatic appointment. Over the years the Government of the Commonwealth of Dominica has utilized this mechanism in several capitals throughout the world. 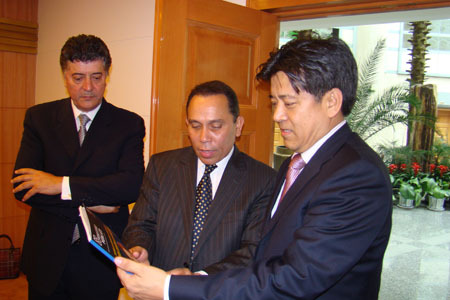 It was done in the mid to late 1990s in Taipai when Mr Jack Sun was appointed as Dominica's representative in Taiwan. Mr Smit was also appointed to represent Dominica in Sweden sometime in the late 1990s. The list goes on. The Government of the Commonwealth of Dominica is not alone in the practice of appointing foreign nationals, some of whom have become naturalized, to represent them at a diplomatic level overseas. The same practice is being used by most member states of the OECS and sometimes by other member states of the CARICOM as well as other countries. I know for a fact that St. Lucia, Antigua and Barbuda, St. Vincent and the Grenadines, Grenada, have appointed Honorary Counsels and Ambassadors throughout the world. In spite of best efforts at due diligence from time to time persons who come highly recommended by representatives from other countries don’t always turn out to be the most desirable of persons. This should not be used as a reason for seeking to denigrate Prime Minister Skeritt and his administration. Whenever someone who has been appointed displays behavior unbecoming or which is perceived to have brought the Government and people of Dominica into disrepute efforts have been made to have these persons recalled promptly. Anonymous the current practice employed by the PM is wrong! Country's appoint people of repute, not 'businessmen'. This will come back to bite us. Anonymous #3 why are you attacking theDominican.net and not asking what really is going on? Why are the appointments secret? Tomer was appointed ambassador to Monaco just last month. Did you know that? Why Monaco; what benefit is there for Dominica? Why is there no ambassdor in the US other than to the UN? Why are Dominicans kept in the dark? Where is the money going? who is getting rich? Thank good for good journalism that keeps the light on the dark deeds of a ROGUE government. The people will not be silenced. Take out your blinders and ask the hard questions of the PM or are you benefiting financially? Who appointed Torner ambassador to Monaco? When was he appointed? Where are you people getting your information from? It was said that Torner established diplomatic relations with Monaco on February 27, 2009. You people are really not after the truth. What are you talking about getting paid? For a moment there I thought that you all were interested in the truth but you keep attacking the Prime Minister and his administration with a bunch of unsubstantiated claims which are very far from the truth. I haven't read any response to the response which was submitted about the economic citizenship re the allegations which were made in the article about ambassadors being given passports to sell. I would also like to read the authors response to the response which was submitted lastnight on the Lakschin matter. And why isn't there any commnet on the contribution of Torner in the representation of Dominica at the UNESCO and in Europe. "On 27th February 2009 at 11 a.m. a joint communiqué was signed between His Excellency Mr Jean Pastorelli and His Excellency Eric Torner, Ambassadors extraordinary and plenipotentiary to the Principality of Monaco and the Commonwealth of Dominica, establishing diplomatic relations between the two States. The signing ceremony took place in the Chancellery of the Embassy of His Serene Highness the Sovereign Prince in Paris, France." The record on Lakschin is clear, truthful and beyond reproach. It clearly states that he was appointed by the James government. The question is why did the PM see the need to sue Switzerland even after it was demonstrated that Lakschin was fined in court, and had shady business dealings in a country where he wanted to represent. It maters not who appointed him, the fact remains that Dominica made a fool of itself by suing Switzerland. On the passports, it is well known that David Hsiu handled some passports. He may not have sold it personally but his agents did since they were channelled through him. The two recipients of the passports we identified did not come to dominica but had the passports delivered to them. The evidence is there and is being collected for possible use in future legal proceedings. This nonsense must stop. To save Dominica further embarassment the next government should revoke every ambassadorial apointment and bring some sanity to this bad/ 'criminal' behavior. Check out the website of Dominica's representative to Switzerland Gilbert Torner; what a bloody shame. http://dominicaconsulate.ch Can Dominica really be taken seriously? Mue hunte!!! This is unbeleivable. How can Dominicans accept that. Are we too busy trying to fend for our families that we do not care what is happening to our beautiful country? First of all, it is not possible for someone who to be accredited to a country unless there is already diplomatic representation. Therrefore it is not possible for Eric Torner, Dominica's ambassador to UNESCO to be appointed as ambassador to Monaco before the establishment of diplomatic relations between the Principality of Monaco and the Commonwealth of Dominica. It is only after the establishment of diplomatic relations can someone be appointed by the following procedure: 1. the request from Agrement from the receiving State, in this case, Monaco; 2. the head of State of the sending State, in this case it would have to be Dominica must present credentials to the ambassador designate; 3. the ambassador designate must finally present his credentials to the Head of State of the receiving State. It is shameful that a few government officials are pocketing millions of dollars while unemployed beggars wander the streets. My wife and I were considering moving to Dominica to live and start a business because we love the island and the people. However, given the obvious state of corruption, I think we will wait awhile and see what happens. Take back your country! Put in place a government that is fully accountable to the people.....and honest investment from the outside will follow. What does Monaco has to offer Dominica? Maybe another tax haven. The majority of that country citizens are rich citizens from elsewhere. Monaco lacks transparency in the legislative, legal or administrative provisions of its taxes and it is also a major off shore banking location for folks who are up to no good!!!!! !Certainly folks like the new ambassador probably does not have the best interest of our small country but don't tell the PM that--he knows best. Someone must tell this Prime Minister who thinks that our island home appears to be his playground that Dominica is not for sale and that he will be held responsible and dealt with accordingly- of course in a court of law i.e if we can catch him before he escapes to Monaco. Folks we maybe heading slowly in the direction of a failed state- Haiti, Somalia, Robert Mugabe-------- Please speak out and don't remain silent. Anonymous, who do you think you're fooling. Why read it in French when the English version clearly states that he presented his credentials as ambassador to that country. Read the tea leafes before you blindly defend criminal behavoir on the part of the ruling party. Shame, Shame, Shame on Mr. Skeritt for appointing these unsavory characters to represent our country's interest. I guess Skeritt is really only concern about his pocket not Dominica's welfare. It is time that Dominicans kick this man out of office before it is too late. Train do you owe your livelihood to Skerrit? I suppose if so you can defend all you want but guess what? Sooner or later life catches up with all of us----a word to the wise. Dayo, you all see no good in DA...but look for the few false negative and magnify to satisfy your tainted and warp political illusions. You and the opposition will fail, because Dominicans are smarter than you people. Wait Train--we are all Dominicans--and yes we are smarter.......and can see when something or someone is no good for our country. Dayo, happy easter to you and your family. your tactics will not work , so keep writing crap. I tell we Dominicans are smarter than the opposition. Discredited "ambassador" Roman Lakschin and his wife Ludmila have been residents of Monaco since 1980, whilst retaining business interests in Switzerland. Mr. Torner,equally with Swiss connections is now our new ambassador to the principality of Monaco....coincidence??? Train Dominica is a small country and you keep talking about opposition. Obviously we have two very different perspectives. Yours is an antiquated one. What we are talking about is about a PM who is not qualified to run our country. That's it. While we can't do anything about this until elections, we are starting a dialogue and peaceful movement to get him out of office. That is democracy. That is what other sucessful movements all of the world have done. What's wrong with that? Can you please be a bit more respectful and professional on this board? Stop singing for your super!!!!!! with a PM this and a PM that. You owe it to Dominica and not to Skerrit. Look when Skerrit leaves oofice and hopefully soon, the next person who is the PM will have to face the same or similar music Train. Can you see that far or do you need glasses? The job of PM is too important to give anyone a free ride Train. Don't be that myopic. Skerrit and his gang must go!!!! As a person who was born on Dominica the selling of passports is outrageous. These people selling the passports should be jailed. How come the Dominica prim minister is not under investigation.He should be the first one put in jail. When i was growing up on Dominica in the 1950's and 60's selling Dominican passports was un-heard of. If you wer not born on the island you could not get a passport.Something fishey is going on, organized crime. The U.S. Justice department needs to get involved because U.S. citizens are buying Dominican passports too to hide money. In yesterday's blog, I described a program for "economic citizenship" from Lithuania, that, according to the Lithuanian embassy, has no legal basis. For that reason, I recommend avoiding it. However, two countries—the Commonwealth of Dominica and the Federation of St. Kitts and Nevis—have "citizenship by investment" programs fully authorized in law. Dominica, sometimes called the "nature island of the Caribbean," is located approximately 300 miles southeast of Puerto Rico. Not to be confused with the Dominican Republic, it's an amazing island with mountains rising nearly 5,000 feet out of the ocean, a boiling lake, and the last original settlement of native Americans in the Caribbean. A former British colony, Dominica has been independent since 1978. Dominica's gorgeous scenery, clean water, pure air, and a largely unspoiled environment have made it a popular eco-tourism destination. But the country’s rugged coastline, lack of sand beaches, and the absence of a large international airport have hindered its growth. Dominica also is periodically affected by hurricanes, although it's at the southern tip of the Caribbean hurricane belt. Last summer, it suffered a severe blow from Hurricane Dean, although damage was limited to its agricultural sector and didn't seriously affect business or tourism. The face of America is shifting as the economy weakens. The days of prosperity and envy are long gone and it's time to make a choice live the life of your dreams or let your retirement and investment portfolio sink when things get worse. With a price starting at only US$75,000 for a single applicant (US$100,000 for a family), the cost of Dominican economic citizenship and passport is relatively low. Legal and due diligence fees add approximately US$25,000 to these costs. To qualify, you need to pass a background check, have a genuine interest in Dominica, and speak English fluently. With a Dominican passport, you can travel visa-free to about 50 countries and enter another 40 or so by obtaining a visa upon entry or with minimal formalities. The passport provides a substantially expanded ability to live or work in any of Caribbean Community (CARICOM) countries, which in addition to Dominica are Antigua & Barbuda, The Bahamas, Barbados, Belize, Grenada, Guyana, Haiti, Jamaica, Montserrat, Saint Kitts & Nevis, Saint Lucia, Saint Vincent & the Grenadines, Suriname, and Trinidad & Tobago. Like Dominica, St. Kitts & Nevis are beautiful islands. The mountains aren't quite as tall, but the scenery remains breathtaking. Former colonies of Great Britain, these two sister islands form a federation that has been independent since 1983. A bit further north than Dominica, St. Kitts & Nevis is also subject to hurricanes. In 1998, Hurricane Georges caused more than US$400 million in damages. St. Kitts & Nevis is somewhat more prosperous and developed than Dominica, and the price of the economic citizenship program is higher. There are two options: you can purchase qualifying real estate with a value of US$350,000 or more (plus a one-time 10% payment of property tax), or make a contribution of US$200,000. Application, registration, due diligence, and legal fees add a minimum of US$15,000 to these figures; substantially more if you opt for the qualifying real estate option. The St. Kitts & Nevis passport provides slightly improved travel options in comparison to Dominica. Since St. Kitts & Nevis is also a CARICOM member, the benefits of improved access to CARICOM countries apply to both passports. But perhaps I'm getting ahead of myself. Why get a second passport at all? There are many reasons. A second passport can expand your travel possibilities. It can also protect your identity, should you ever need to keep your nationality a secret for safety reasons. It can give you the right to reside in other countries, and give you a way to cross international borders if your primary passport is lost or stolen. For U.S. citizens, a second passport has another benefit—it's a necessary prerequisite if you want to legally disconnect, once and for all, from the U.S. tax system. The only way to eliminate all U.S. tax liability is to cease being a U.S. citizen. But before you do so, you must obtain citizenship and passport from another country. Cheap, cheap, cheap! Is it possible that I can gain some improvements based on the funds flowing in. This seems like an extremely lucrative well organized business. Dominica recorded a 3.2% economic growth in 2008. OAKLAND, Calif. — A former executive with Goodwill Industries will remain in jail while he awaits trial on charges that he bilked the charity out of $800,000. A federal magistrate denied a bail request Friday by Andrew F. Liersch, who prosecutors said had obtained a foreign passport, perhaps as a prelude to fleeing the country. But Magistrate Wayne Brazil said the bail issue could be revisited later — Liersch can ask family members to help him post a large bond. Liersch, who retired in 1994 as president of the Goodwill operation in Santa Clara County, has denied fleecing his former organization and pleaded innocent. His attorney, Ted Cassman, said that Liersch, 67, is being targeted by disgruntled former employees. Cassman had asked that Liersch be released on a $250,000 bond, but Assistant U.S. Attorney Mark Zanides said prosecutors fear he might flee. Liersch owns a home in Guatemala, where officials expelled him when U.S. authorities alerted them that he had been indicted by a grand jury. He was arrested May 23 at Los Angeles International Airport. Zanides said Liersch has tried to conceal large amounts of personal wealth and has a passport from the Commonwealth of Dominica, a Caribbean island which has no extradition treaty with the United States. Brazil said he was concerned because Liersch had apparently failed to tell his fiance, who lives in San Francisco, about the Guatemala house. Liersch is accused of being part of a ring that bilked Goodwill of Santa Clara County out of $26 million during his nearly 20-year career. Prosecutors allege that in return for $3,000 a week in cash, Liersch looked the other way while employees skimmed off and sold valuable items that had been donated to the charity. Dominica thanks for the article. That's just what we have been trying to say. These passports are convenient for crooks who wish to take advantage of Dominica. When will we wake up and put an end to this madness. As a Dominican by birth now living in the US and entitled to a "Real" Dominican passport, I am saddened at the sad state of affairs where Dominica is for sale (passports) What is the government of Dominica up to? The person, persons, responsible for selling the passports should all be in jail, i.e. ; the prime minister and all his hench men. Why do the people of Dominica keep putting these crooks in charge of the country? People of Dominica quit the carnival and take charge of your destiny before it is too late and you become a dictatorship run Island. what the hell happening to our country???? is like we prostituting ourselves and traveling will become harder for us because other countries will put us under scrutiny and pressure. NO Matter how you put it DOMINICA leadership is gone , everyone in there now is only about money, money, money. and if you follow them well its history of the 70s repeating itself in disguise.I t was a shame to find out that politicians in Dominica government having sexual and drug liaisons with underage girls? In an age where we are talking about child protection??? ?And the revelations listed in this article talk s volume for itself. makes me think that DOMINICANS have a right to hide themselves and nationality when they are in foreign countries . Freedom Party brought in the economic citizenship program just like the Great USA and all other OECS nations. When it was done by the Late Dr. Dame Mary Eugenia Charles it was strictly monitored and all the money was going to one account and all the monies accounted for. It was when the UWP came in things changed and passports was being sold even by former polices officers who were known criminals. When Lab our party Came in the corruption continued well, a number of top politicians names were called and one from the north was branded lazy and his ministry was even taken from him. All Dominicans knows that the Dominica Freedom Party had the cleanest record and the most respected Government Dominica ever had. The Problem that have the Dominica Freedom Party suffered is that the party did not stand up for its supporters and the party crumbled. This is a thorough investigation that merits much credence to the author. Remember the truth always hurts.Good job Thompson.